Well, according to the calendar the first day of spring has come and gone but here in Vermont we know that “old man winter’ isn’t completely done with us yet. We’ve still got some more cool days and maybe even a dusting or two of snow to go before the season really opens up to what we all consider “spring” weather. It is however “grilling season” and that means the smell of smoke is in the air and the flavor of BBQ is back in our lives!!! YUM!!!! Nelson’s has many grills and smokers to choose from. We have Weber gas and charcoal grills in every size and color. If you prefer the charcoal cooking method we can hook you up with a Weber original kettle grill in 18” or 22”, or a Master-Touch, Performer or Premium Performer all in 22”. It takes a little longer to preheat than gas but the flavor is un-beatable!!! 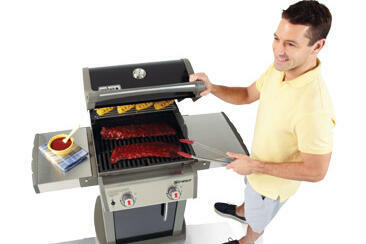 If you prefer gas grilling, we also carry many, many Weber gas grills in a size and style to fit every budget. The speed and ease of grilling on a weber makes every grilling experience as wonderful as the food that it cooks!!! We stock Weber replacement grill parts as well as cooking accessories and covers. And then there are the smokers. We carry Traeger wood fired pellet smoker/grills. You can smoke OR grill on these amazing units. Turn up the temperature to grill quickly or lower it to smoke anything to perfection. We also carry Traeger wood pellets, sauces, rubs and accessories. Electric smokers are available at Nelson’s, as well as smoking chips in Hickory, Mesquite, Apple, Cherry, Pecan……the list goes on and on. We have the Ace 2018 grilling catalog in stock as well so if there is something you are looking for that you don’t see, just ask and we’d be happy to see if we can order it for you. At Nelson’s “We specialize in special orders”!